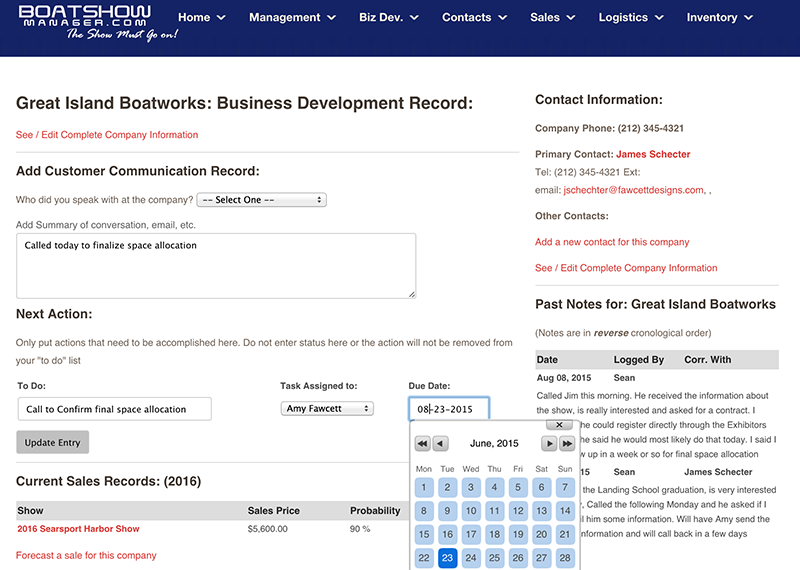 “BoatShowManager" is a full-featured Customer Relationship Manager (CRM), Business Development, Sales Management, and Show Operations application developed by a boat show manager for boat show managers. This system was first developed in 2005, and is now in use by multiple show management companies across the United States. Because the system is cloud-based and responsive design, (compatible with computers, tablets and smart phones), your entire staff (and your exhibitors) are connected and can effectively manage all show functions at any time, from any platform, anywhere in the world. You never have to worry that someone is working from outdated information. The system includes the “Exhibitor’s Portal” which allows your customers to securely interact with, and upload, show data. This streamlines the entire show management process and transfers workload from your show staff directly to the exhibitors themselves, improving accuracy and substantially reducing cost. The Exhibitor’s Portal also includes the unique “Readiness Dashboard” which allows exhibitors to see at any time what they still need to do, prior to moving into the show. The system features a secure credit card payment gateway (through Authorize.net) which allows the full automation of the pre-registration and contracting process. Returning exhibitors can log-in, fill out an application, specify booth or space requirements, sign a contract and pay the deposit, all online. All the show management team needs to do is approve the application... the deposit is already in the bank. Additionally, as the show dates approach, exhibitors can order exhibitor's badges and customer guest tickets, upload tax, insurance and move-in documents, and make subsequent payments, all through the Portal. We would love to help you discover how BoatShowManager can help you improve your business process and bottom line. Contact us through This Page and we will arrange a no obligation online demo of the system!